Two weeks ago I went to pick a package from the post office, and I wasn't sure what it could be. Well, turns out it was the Scandinavian UL Mystery Box which was waiting for me! The Mystery Box started in Norway, went to Denmark and came via a small detour to a honorary Scandinavian to Finland. 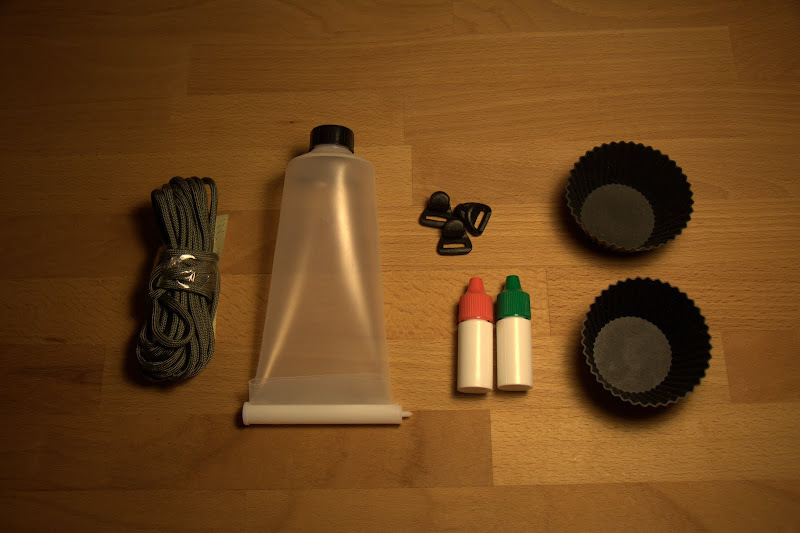 I took out some Paracord, a resealable tube - excellent for pesto or tomato sauce, I think - two mini dropper bottles so I can scale down my Hygiene kit even more, two silicon muffin cups for some Groovy-Biotoc Muffins and a couple of MYOG bits for future projects. Have you been in your 'bits box' recently? Are all those little bits'n'bobs, doodads, thingummys and what-nots still in there? Perfectly serviceable but lying dormant and unused? Well, lets share these 'bits' with like-minded folk by adding them to the Scandinavian Mystery Box. When the Mystery Box arrives at your house simply have a rummage, take out what you want, put something in and send it on to the next person. We'll keep this in Scandinavia for now. Lets keep things pertinent and lightweight. This is not the place to get rid of that 6lb tent and unused Trangia! I'd like thus to send out a call to all Finnish lightweight and UL folks - be you just starting out or if you're already since years with minimal gear on the trail, everyone is welcome. Just send me an Email with your Address (it is on the right under the Creative Commons note), and I'll add you to the list the next time it arrives here. Swedes, Danish and Norwegians (and Icelanders, should there be any reading here!) also are welcome to send me an Email if they would like to participate, I will then add them to the list as well. Your address will be private at all time, and only used for sending you the Mystery Box. I'm looking forward to many emails, and let me tell you - there were some very nice pieces in the Mystery Box, so it is well worth to participate!